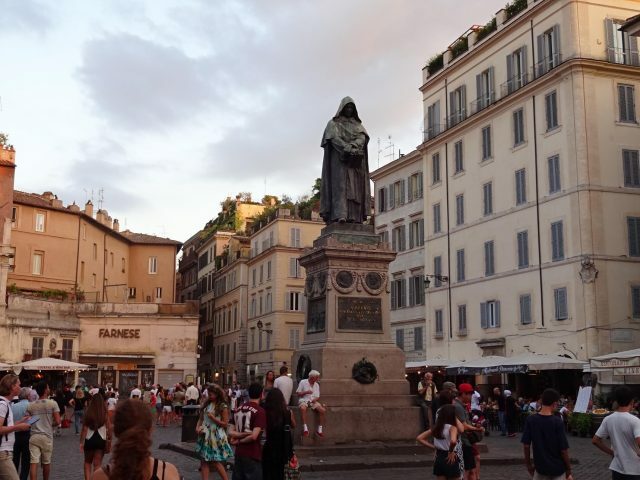 Before Galileo did anything in astronomy, the Italian philosopher Giordano Bruno argued that the Earth moves around the Sun. Bruno believed that the Earth is a living being, with a soul. These were unusual beliefs for a Christian. In 1592, Bruno was captured by the Inquisition in Venice and imprisoned. The next year he was transferred to the Inquisition’s prison in Rome. After seven and a half years of interrogations, he was finally condemned to what was widely feared as the worst kind of punishment: he was gagged, taken to a public place, tied to a post, and burned alive. Historians are quick to point out that Bruno was not killed for his belief in the Earth’s motion, but for heretical religious beliefs. For years I investigated this story and what I found really surprised me. 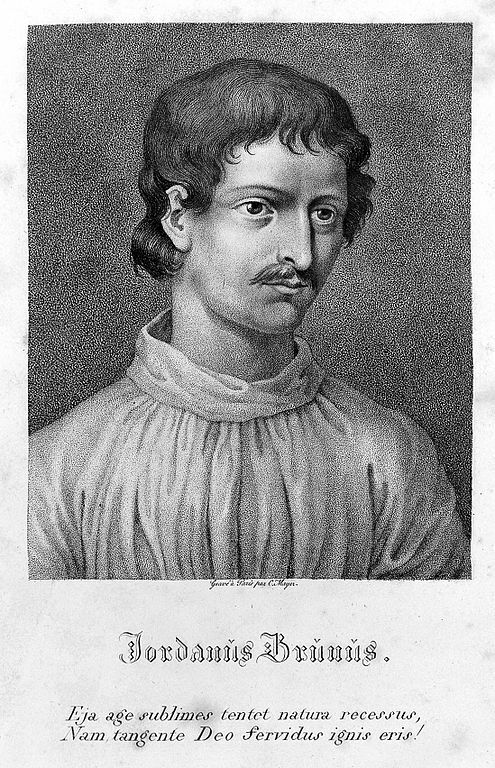 It turns out that Giordano Bruno’s belief in the moving Earth was directly connected to some of his beliefs that were heretical. To Catholics, heresies were willful departures from Catholic dogma. Heresies were the worst kinds of crimes, even worse than murder. Heresies were crimes against God. 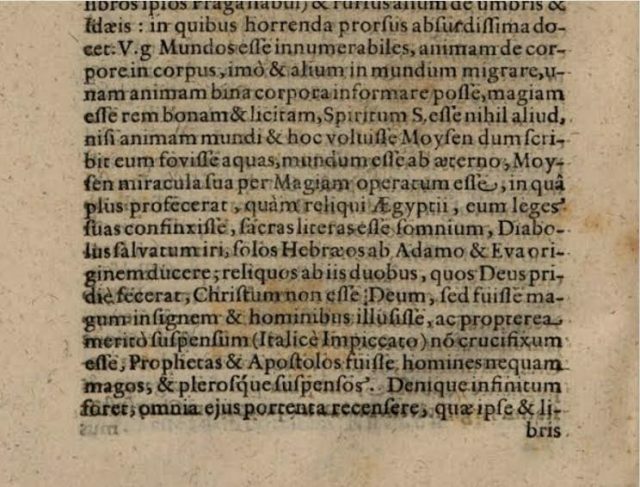 Bruno’s final condemnation by the Inquisition exists only in a partial copy, prepared for the Governor of Rome. Unfortunately, it omits the list of accusations against Bruno, that is, his alleged heresies. But there is some good evidence of what they were. The statue of Giordano Bruno at the Campo de’ Fiori, in Rome. The plaque reads: “9 JUNE 1889. TO BRUNO. THE CENTURY PREDICTED BY HIM. HERE WHERE THE FIRE BURNED” (via author). 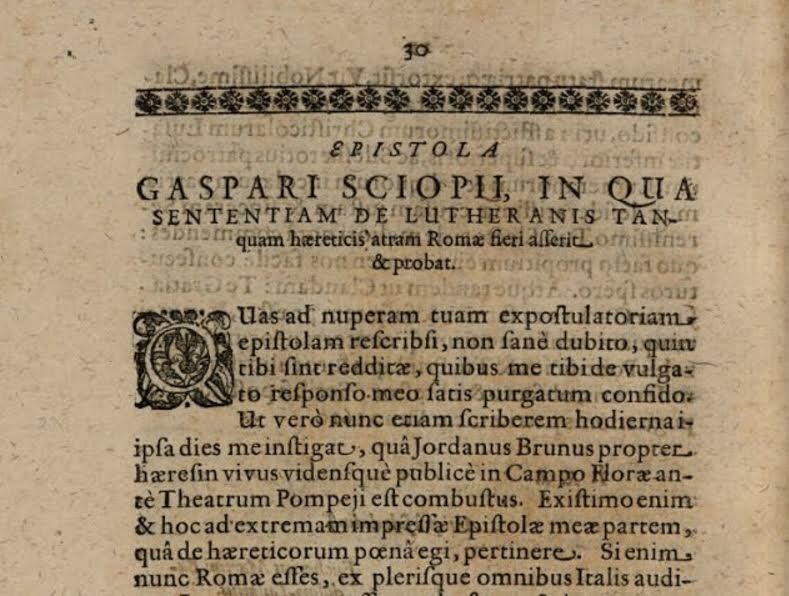 Excerpt of Gaspar Schoppe’s letter from February 1600, published in 1621, stating Bruno’s “horrendous” beliefs and teachings (see below for source). This means that if the Lutherans held these teachings or beliefs, docere neque credere, they would be burned. It also means that Bruno was burned for these teachings and beliefs. 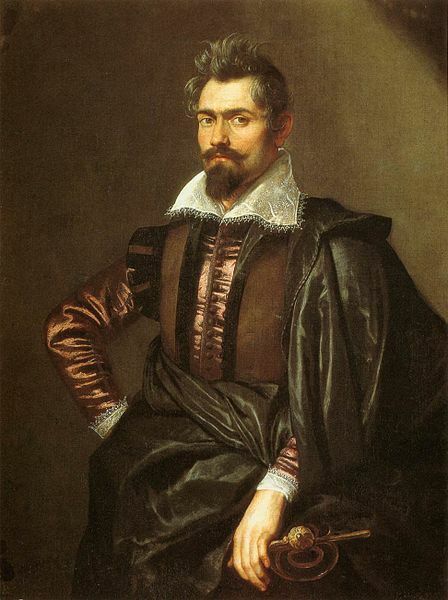 A portrait of Gaspar Schoppe by Peter Paul Rubens, 1606 (via Wikimedia Commons). The two accusations above recur throughout Bruno’s trial, from its beginning to the end. It turns out that both were directly connected to Bruno’s conviction that the Earth moves. And most importantly, surprisingly, I found that these beliefs were heresies. First, Bruno had said in nine books that many worlds exist: not just the Earth, but the Moon, the planets and the stars: “innumerably many worlds.” Apparently he didn’t know it was a heresy to claim that “innumerably many worlds exist.” This belief had been denounced as a heresy by many authorities including Saint Philaster, Saint Jerome, Saint Augustine, and Pope Gregory XIII. Catholics were horrified by this idea, because if many worlds exist then Jesus Christ would have to be born and crucified in each of those worlds to offer salvation to the beings in such worlds. Second, Bruno said that the Earth has a soul. In twelve of his books he repeatedly asserted that the world has a soul, the Earth has a soul, or the universe has a spirit. According to Bruno, the Earth was alive, like an animal. Just as our bodies are made from matter, from bits of the Earth, so too he said that our individual souls come from soul of the Earth. Yet this belief that heavenly bodies are animated had been declared heretical by the Fifth Ecumenical Council in the year 553. Similarly, in 1277, Bishop Etienne Tempier in Paris had condemned as a heresy the belief that the heavenly bodies are animated, like animals. This was viewed as a belief of ancient pagans, not Christians. 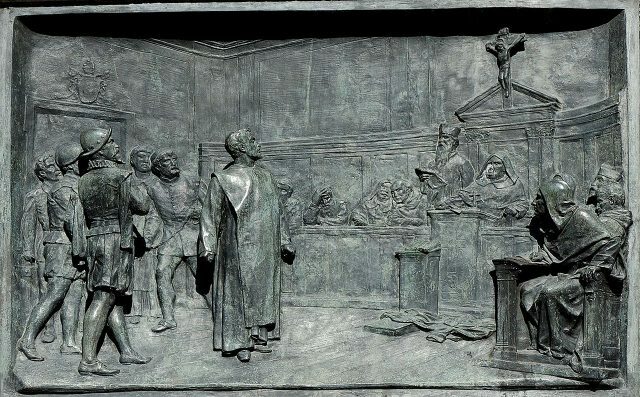 Relief depicting the trial of Giordano Bruno, from the base of the Ferrari statue in Campo de’ Fiori (via Wikimedia Commons). Books on heresies echoed this statement. 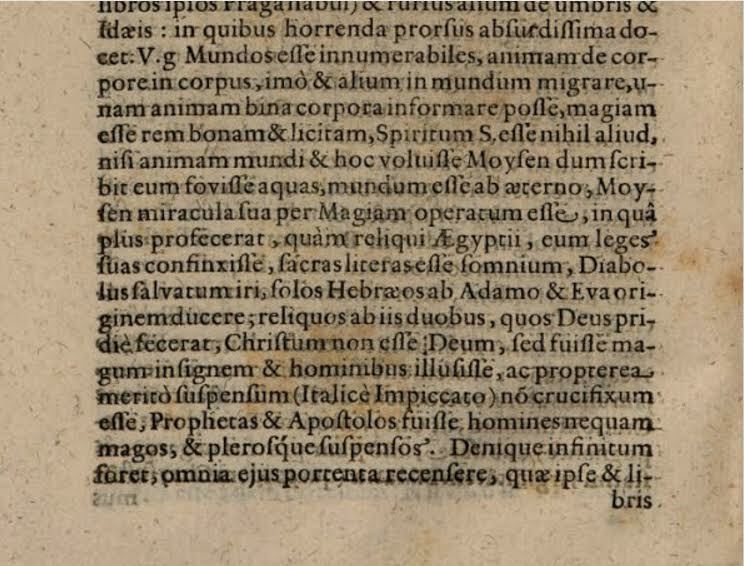 For example, in 1590, Tiberio Deciani published a Criminal Treatise on All Heresies, in Venice, including the heresy that the Holy Spirit is the soul of the world. Yet Bruno said that to the Inquisitors in Venice when he was interrogated in 1592. And Bruno repeated it to the Roman Inquisitors; he “relapsed” into this heresy. Anyone who relapsed into a heresy, after being instructed to abandon it, was a proven to be an obstinate heretic. So these heresies about many worlds and about the universal soul were linked to Bruno’s conviction that the Earth moves. It moves because it’s a heavenly body. It moves because it has a soul. Still, is there any direct evidence that the Inquisitors were aware, concerned, or annoyed, specifically, by Bruno’s claim, in three books, that the Earth moves around the Sun? 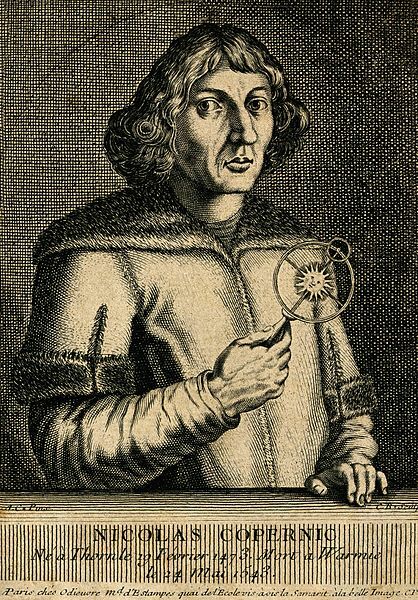 A line engraving of Nicolaus Copernicus (1473-1543) . Copernicus is holding a model of his heliocentric theory (via Wikimedia Commons). This all means that Bruno’s belief in a moving Earth was part of the heretical worldview that he advocated both in his books and in his trial. His ideas about many worlds and about the soul of the world convinced him that Copernicus was right: the Earth moves. Those same ideas about worlds and souls led Bruno to his death. Sixteen years later, in 1616, when Galileo first got in trouble with the Inquisition in Rome, four of the same Inquisitors and Consultors from Bruno’s trial also met with Galileo. One of them was now the head of the Inquisition. Another one was now the head of the Index of Forbidden Books. And another was now the Pope. But Galileo was more cautious than Bruno. 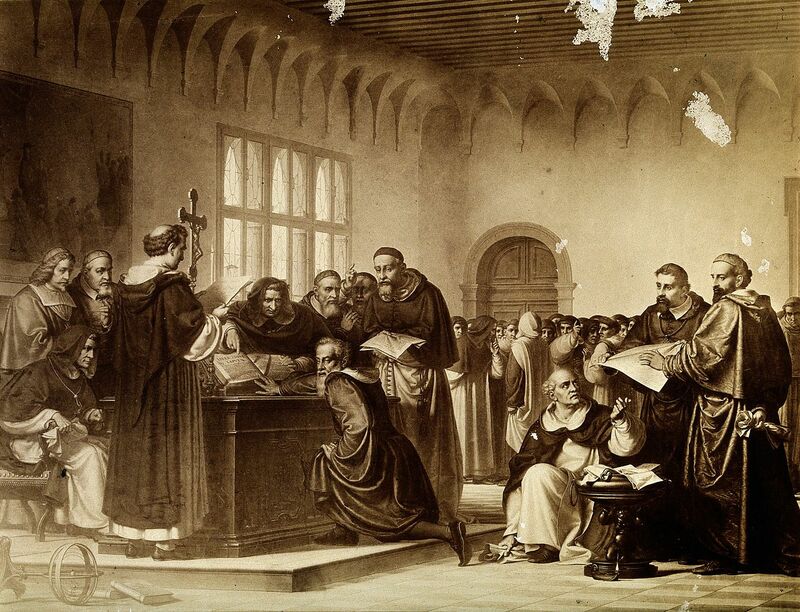 Illustration depicting Galileo Galilei at his trial by the Inquisition in Rome in 1633 (via Wikimedia Commons). Galileo denied that the Moon was another world, even though he discovered—he saw with a telescope—that the Moon has mountains and valleys. Bruno had actually predicted that, whereas Copernicus had not. Galileo didn’t say that “innumerably many worlds exist,” though he proudly wrote that he had discovered “innumerably many stars.” Bruno, not Copernicus, had predicted that too. Galileo discovered moons around Jupiter. And again, Bruno had predicted that some planets have moons, like the Earth, while Copernicus had not. Galileo did not tell the Inquisitors about any soul or universal spirit that moves the Earth either. But in two private letters, in 1615, he guardedly admitted that he believed that the Sun can be described as the soul of the world and that it transmits a spirit throughout the universe, a spirit that gives life and movement to all things. Even the Earth? After meeting with the Inquisitors in Rome, Galileo never again wrote about the universal spirit that vivifies and moves all things. We don’t even know if the Inquisitors knew that, in private, secretly, quietly, Galileo too entertained such ideas. Bruno was not killed for his belief in the Earth’s motion. But this belief was directly linked to key heresies that led to his execution. The trial of Bruno was in the background of Galileo’s troubles with the Inquisition. Galileo lived in the haunting shadow of the burning man. Photo Source: Gaspar Schoppe to Konrad Ritterhausen, 17 February 1600, printed in Gaspari Scioppii, “Epistola, in qua sententiam de Lutheranis tanquam haereticis atram Romae fieri asserit & probat,” in Machiavellizatio (Zaragosa: Didacus Ibarra, 1621), pp. 30-35. Alberto Martínez on Darwin’s Finches & Other Science Myths. More of Alberto Martinez’s works and writings can be found here.